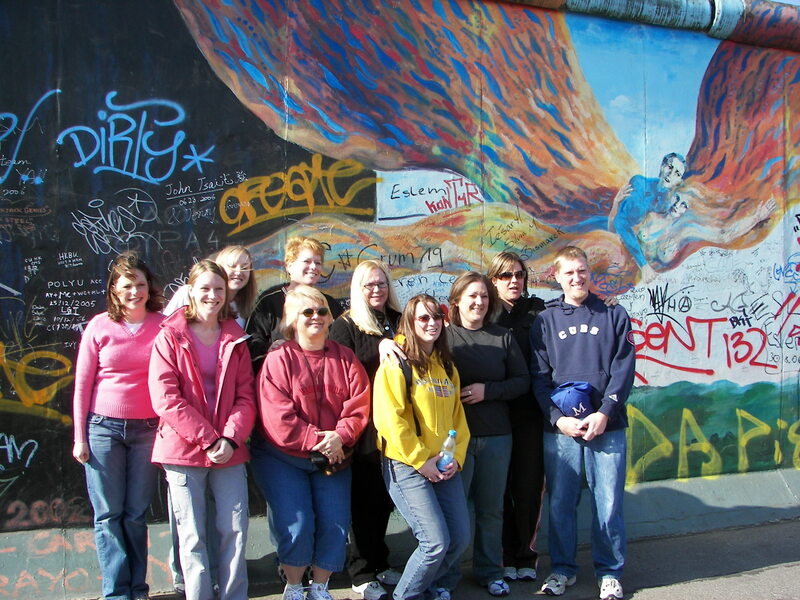 The grown ups pose for a picture in front of the Berlin Wall during TAP’s first trip. During the fall of 2006, a group of Minooka, Illinois area teachers had a conversation about how to make learning more authentic for their students. Several of these teachers had had some life-changing experiences of their own while traveling around the world. That fall, Minooka TAP (Travel Abroad Program) was born. That group of teachers, looking at Minooka’s 8th grade curriculum, discussed the possibility of ending the school year with a trip to the very places their students had been studying all year long. TAP immediately selected Germany as their first destination. What better way to study some of the 8th grade curriculum like WWII and The Diary of Anne Frank than to take a trip overseas and visit Berlin, Dresden, Munich, and the very concentration camps the Frank family bravely sought to avoid? Interest for that first trip was high and before long, the TAP teachers had selected 25 students to travel with them over Spring Break ’07. 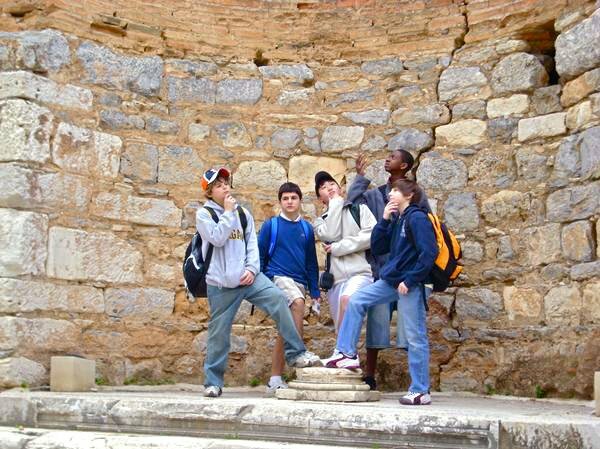 A few TAP boys were lost in thought in the ruins of Esephus, Turkey. Throughout the school year TAP prepared for their trip – studying German culture and history, researching the places they’d visit, watching movies, and reading books about Germany and its history – as well as prepping for the adventure of airports, hotels, and buses that were in their future. The first TAP trip was amazing. Six teachers, 25 students, and a handful of parents and grandparents made a giant loop around Germany, making stops in Berlin, Dresden, Nuremburg, Munich, the concentration camp at Dachau, Neuschwanstein Castle in the Bavarian Alps, Rothenburg, Heidelberg, and ending the trip with a day long cruise up the Rhine River along the French border. The Grand Canal in Venice, Italy was the perfect photo stop. Before that trip was even over, the teachers had begun planning future travels. Since 2007, TAP has visited Germany, England, Greece, Turkey, Italy, Vatican City, Ireland, Northern Ireland, Spain, Portugal, Gibraltar, Morocco, Japan, Wales, Poland, Slovakia, Austria, and the Czech Republic – seeing amazing things like Buckingham Palace, The Parthenon, The Colosseum, The Sistine Chapel, countless Irish castles, The Rock of Gibraltar, The Alhambra, Mt. Fuji, Big Ben, and the Auschwitz Concentration Camp . In June of 2015, we’ll add South Africa to that list, studying history, culture, geology, mythology, literature, art, and architecture. And in June of 2016, TAP will head back to Europe and tour the Netherlands, Belgium, Luxembourg, and France. Over the years, the group has grown immensely, although the same core of teachers bring their experience and wisdom each year. For our students, TAP is a year and a half long program that prepares kids for every aspect of their travel – from handling foreign money to connecting with ancient history – from experiencing a new culture to packing a suitcase efficiently. In recent years, TAP has begun to expand outside of the Minooka area, and in 2015 we officially changed our name to reflect that growth. We became known as TAP Adventures. TAP is not a school district sponsored program, so we’ve been able to include kids from Chicago, Oswego, Montgomery, New Lenox, Aurora, Yorkville, Plainfield, Willowbrook, Joliet, Lockport, and Lemont in our adventures. We don’t care what your address is, we want the world to be your classroom. 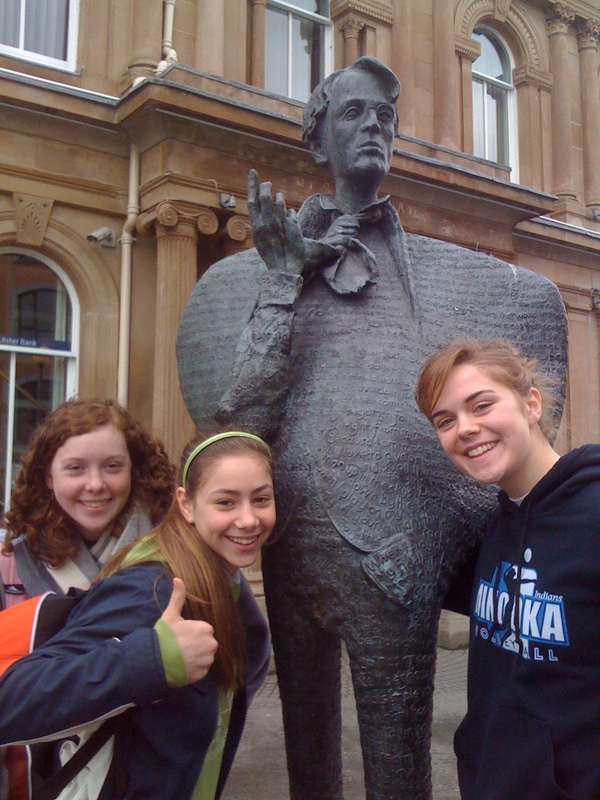 WB Yeats took a second out of his busy schedule to pose for a pic with some TAP girls. TAP is led by Mike Curtis (English teacher at Oswego East High School), Jackie Harig (Social Studies teacher Minooka Junior High), Kris Doerr (History teacher Minooka Intermediate School), Angelica Lara (social worker in Homer), Cathy Tadey (band director at MIS), and Jim Keeton (speech teacher in Joliet schools). Each of these teachers brings their own travel experiences (combined 28 years of TAP trips) and classroom knowledge to making the experience as successful, educational, and memorable as possible for the kids involved. In the end, we feel that there is no better educational experience for kids than learning history where it happened.